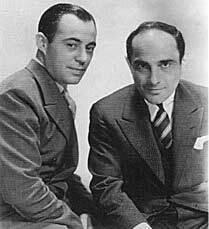 Lorenz Hart (later 'Larry' to everyone but his mother) was born in 1895 to an affluent German immigrant family in New York. He was unusually short in stature, which haunted his whole life, but by contrast super-energetic and intellectually dynamic. His talent for writing words to music was early evident and first put to serious use in teenage summer-camp shows. These shows were also Richard Rodgers' (born 1902 to a New York doctor's family) start in the theatre, but he did not meet Larry Hart until early 1919, when introduced by a mutual friend to collaborate on songs for an amateur club show. Rodgers, then only 16, was deeply impressed by Hart's seriousness and erudition in every aspect of lyric-writing: later he said "I was enchanted by this little man and his ideas. Neither of us mentioned it, but we evidently knew we would work together and I left Hart's house, having acquired in one afternoon a career, a partner, a best friend and a permanent source of irritation." Work soon started, striving for the all-important 'break': projects were developed, shows written and produced, but all without success until THE GARRICK GAIETIES, which opened at the Garrick Theatre on May 17th 1925 for a one-week run, but stayed for 200 performances! With its leading number 'Manhattan', it signalled a new star team on Broadway. The partnership was instinctive and comradely, and ideas were worked out at great speed, Rodgers providing the melodies to fuel Hart's invention. Larry was a sophisticated perfectionist as a wordsmith, but endearingly disorganised as a person; Rodgers, the more methodical and business-like one, would take charge and handle all negotiations. They collaborated with various producers - Lew Fields on PEGGY-ANN, Ziegfeld on BETSY and, in Britain, C. B. Cochran on two shows between 1926 and 1930, in which year Rodgers married. The new 'talkies' in Hollywood beckoned them but only on their second stay (1932-4) were they successful, particularly with Jeanette MacDonald in LOVE ME TONIGHT, in which the memorable 'Lover' and 'Isn't it Romantic' are the outstanding songs. They wrote I MARRIED AN ANGEL for MGM, who then abandoned the project; five years later, Rodgers and Hart adapted it successfully for Broadway and then sold the film rights in the musical back to MGM! Rodgers was far less happy with Hollywood than Hart, though, and was glad to return to New York in 1934. The next years saw a stream of Rodgers and Hart successes - ON YOUR TOES (1936), BABES IN ARMS and I'D RATHER BE RIGHT (1937), I MARRIED AN ANGEL and THE BOYS FROM SYRACUSE (1938), TOO MANY GIRLS (1939), PAL JOEY (1940) and BY JUPITER (1942): apparently a crescendo of achievement for the two writers, but hiding - less and less successfully - the gradual breakdown of the partnership, brought on by Hart's increasing personal problems. One last attempt was a reworking of an earlier show A CONNECTICUT YANKEE in 1943, but it was too late: Rodgers had already forged a new partnership with Oscar Hammerstein II in the immensely successful OKLAHOMA! that spring and Larry's health was deteriorating fast. He died on November 22nd 1943, just five days after the premiere of A CONNECTICUT YANKEE on Broadway. The partnership of over twenty years of two such different yet brilliantly-combining talents left us twenty-eight shows, eight movies and over 550 songs - a legacy for which we are the richer and the happier.